Very Good. 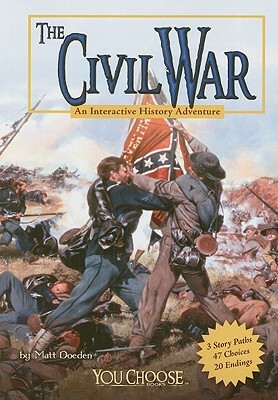 The Civil War: An Interactive History Adventure (You Choose: History) by Doeden, Matt, 2009-09-01. Trade paperback (US). Glued binding. 112 p. Contains: Illustrations, black & white, Illustrations, color, Maps. You Choose Books (Paperback). Intended for a juvenile audience. It's an intriguing idea; reading a book about the Civil War, being able to choose which side you're on, and selecting which path take when opportunities arise. Great insight into the war. I believe that subconsciously I learned a bit more history than what I had known before.